Chrichton's World: Review I.T. (2016): For God's sake be nice to your I.T. guy! Review I.T. (2016): For God's sake be nice to your I.T. guy! I.T. is what you call a stalker film or thriller. Think Fatal Attraction and Cape Fear. This basically should give you an idea what the film is going to be about. (Although to be fair this film never reaches the level of those superior films.) So don't expect any surprises on that front. The I.T. angle however was interesting and compelling though. We now live in a world where we have become dependent on technology so much that we can't live without it and also have implemented it everywhere possible. For the most part these advances are positive and useful. However there is also a negative and darker side that often gets overlooked. In a way this film points out possible dangers you should be aware of. Because believe it or not some of the events in this film are technically possible. Now of course Hollywood wouldn't be Hollywood if they didn't dramatize and exaggerate things a little too much. 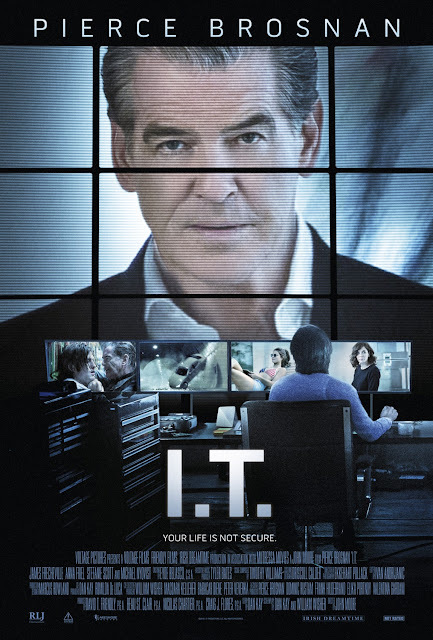 I mean like many other films this film is not afraid of using the typical stereotypes regarding I.T. guys and hackers. Especially after the Michael Mann film Blackhat that is lazy and insulting. Hackers are just people like you and me. You won't be able to tell who they are or what they look like. They come in all shapes, sizes and personalities. So please do make a mental note of that. In the film however it is very obvious that Ed Porter has mental issues. Although I do think that had Mike Regan (Pierce Brosnan) been less of a prick towards him he might not have been triggered. On the other hand the guy was very unstable and it could have happened any moment. In general though I think that sometimes people should be nicer to others. Or at least be civil. No reason to be nasty and impolite to someone else unless of course that person deserves to. Mike Regan does represent those rich guys who are very thankful at the moments when they need your help. But the minute they don't and you happen to meet them they pretend they don't know you anymore or rather want to forget about you. Why? There is no reason to do that. We are all people. We all bleed red don't we? Anyway this is when Ed starts the stalking. He is very effective and therefore terrifying. I liked how his abuse mainly was subtle and psychological. Because that is what makes stalking so difficult and scary to deal with. Stalkers too often are far too clever to get caught and even when you know who the culprit is you won't always be able to proof that they are the ones terrorizing you. Unfortunately this film then goes on automatic pilot and plays out how you imagine it would with very little to no surprises. However this is not a big problem since Pierce Brosnan and James Frecheville (Ed Porter) make you overlook that with their performances. Through them you buy everything including the predictable events. Michael Nyqvist (the original The Girl with the Dragon Tattoo) also has a small role and I wished he would have been in it more. He definitely was one of the highlights in the film. Overall I.T. is a solid and entertaining thriller. Very ideal to watch in weekends in the comfort of your own home. Apart from learning how to adapt a healthy dose of paranoia you won't learn or see anything new or substantial. Meaning the film is totally forgettable. But since I had not big expectations that is ok with me.